Originally published under the title "NATO Should Tell Turkey: 'This Thanksgiving, You're Dumped'." Turkey is not fit to be in a formal military alliance with the UK and America. It's time to dump Turkey from NATO, and immediately suspend its accession process to the European Union (EU). There, I said it. Some of us have been expressing deep concerns about the regress of the country of Ataturk for years, while others, including Britain's Prime Minister David Cameron and his European Parliamentary colleague Daniel Hannan MEP, have been agitating for an immediate inclusion of Turkey into the EU. It simply cannot happen. This morning's downing of a Russian jet underscores the problems with Turkey's NATO membership and EU accession. It is perhaps not the worst example of how Turkey is not fit to be in a formal military alliance with the United Kingdom and the United States, but it underscores the point that the country is simply not ready – not even as ready as it was pre-2000. The country has regressed in three key areas as far as Europe and the United States should be concerned: on security matters, on human rights matters, and as a hub for mass migration into Europe. 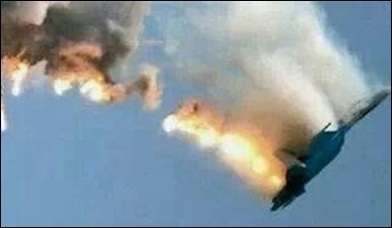 This morning, the Turks shot down a Russian aircraft. So far, reports indicate the Russian SU-24 skirted into Turkish airspace, which, of course, the country is within its rights to defend. The attack comes after a number of incidents in which the Turkish government has accused Russia of violating its airspace. In October, Turkish Prime Minister Ahmet Davutoğlu made clear the nation's intentions to shoot down a Russian plane should the nation violate its airspace one more time: "Even if it's a flying bird, whoever violates Turkish airspace will be subject to the necessary actions... Turkey's rules of engagement are valid for Syria's, Russia's or another country's warplanes." A Russian SU-24 was shot down by Turkish aircraft on November 24. But Turkey had made clear it was not comfortable with Russia's presence in the Middle East at all from the start. Davutoglu called Russia' involvement "very dangerous" and expressed a hope that "İnşallah [God willing] Russia will not insist on ways and methods that will increase the tension." Turkey's open prejudice to any Russian involvement in the region – likely a response to Putin's warm relationship with Syrian leader Bashar al-Assad – taints its decision to attack today. What are the chances that Vladimir Putin or his generals had genuinely ordered one of his Syria rebel-focused aircraft to attempt a bombing run on Istanbul? Nil. Just look at how the Brits react to Russian "provocation" in our air space to determine what a grown up response to this sort of relatively normal behaviour is: "Pilots say the encounters are not hostile and they sometimes even wave at each other." The situation is obviously more tense on the Turkey-Syria border than it is in the North Sea. But what the Turks will hopefully have thought about before shooting down this aircraft is the NATO ramifications. If and when Mr. Putin responds, how will the United States and European allies react to Turkey invoking Article 5 of the NATO treaty: "collective defence means that an attack against one Ally is considered as an attack against all Allies." I'm not interested in my country going to war with Russia because the Turks can't keep it in their pants. I'm not interested in my country going to war with Russia because the Turks can't keep it in their pants. And I'm certainly not interested in going to war on their behalf when they have been integral to the funding of terrorists groups like ISIS, and indeed massively useful to Al Qaeda affiliates like Al Nusra Front. In fact we shouldn't be flippant about Turkey's slide into Islamism. President Erdogan has dragged a previously secular state into an almost all-out war with its Kurdish population, and has presided over a shift in Turkish policy towards Israel, which Mr. Erdogan accused of "crimes against humanity" in 2008. Unsurprising, perhaps, given the country's noteworthy aggrandisement of the Muslim Brotherhood, and assistance with the Gaza flotillas, but still worthy of comment, and perhaps indicative of the fact that a regional, rather than ideological bloc like NATO is a little outdated itself. Over the past four U.S. presidents, NATO has approved 16 non-member states as "major, non-NATO allies" – including Israel, Australia, Jordan, Argentina, and Thailand. Turkey's cheap assistance to ISIS, literally and figuratively speaking, makes it diametrically opposed to the goals (or should-be goals) of the West towards the terrorist group. And what a crock the country has become in the way of human rights, with Kurds in Turkey, though not without their own faults, under collective oppression and denigration at the hands of the state. European security sources have been remarked that Turkey has used, and will continue to use Europe's migrant crisis to rid themselves of the "troublesome" Kurds. Arresting journalists, blocking social media platforms, and even cracking down on basic liberties like the freedom of assembly, Turkey is slipping into being an Islamist, de facto dictatorship with curious electoral practices. 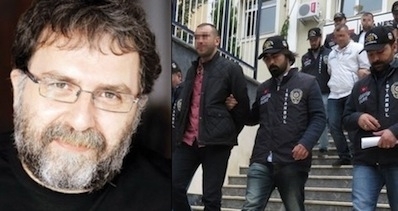 Hurriyet columnist Ahmet Hakan (left) and the men who brutally beat him last month (right) shortly before all but one were released. Working in a media organisation that covers any aspect of Turkish government could result in dire physical consequences. Take the case of anti-Erdogan columnist Ahmet Hakan, beaten by a mob on his way home from work. Or the newspaper where he writes, Hurriyet, which was attacked twice in September by Islamist mobs shouting "Allahu Akbar" and looking to tear down their offices. A majority party Member of Parliament led the mob in at least one of these attacks. When it isn't an angry Islamist rabble tearing down the doors of a media organisation for balanced coverage of Erdogan's rule, it's the police, as in the case of multimedia company Kozi-Ipek. Kozi-Ipek, home to two newspapers and two television networks, was raided in late October by armed officers, who stormed the networks' control rooms and shut down live broadcasts. The images of producers demanding to know why they were being shut down traveled the world, and the newspapers raided dressed their covers in all-black the next day to mourn their demise. Following the raid, most of the staff in all four media companies were fired, to be replaced with more malleable writers, editors, and producers. The human rights situation in Turkey is deteriorating so fast that even the European Union, in a recent, conveniently post-election assessment reported: "Over the past year, significant shortcomings affected the independence of the judiciary as well as freedom of assembly and freedom expression." EU Enlargement Commissioner Johannes Hahn cited "increased pressure and intimidation of journalists and media outlets." While not a perfect bloc, there is perhaps no other member state in NATO that the same criticisms could be hurled at – even though some persistently try, for internal EU reasons, with Hungary. It should be, by now, clear that Turkey is not and has no intention on playing a blocking role in the mass migration from the Middle East into Europe, despite EU promises of around €6bn in inducements for the country. 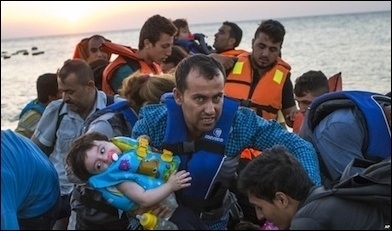 Turkey has no intention of acting to block mass migration from the Middle East into Europe. Besides using the crisis as a means by which to shift their Kurdish problem into Europe, the Turkish authorities are also known to be in cahoots with traffickers loading up boats full of migrants in the Mediterranean. Why? Because, in Prime Minister Ahmet Davutoglu's words, Turkey has no intention of being "a concentration camp." This is a very nice, or rather deliberately misleading, way of putting it. What it means is that Turkey will take the billions of euros of taxpayer cash from the EU, but that it will scarcely make any attempts to stop hundreds of thousands of people migrating into Europe. Europe's border security agency Frontex states: "A noteworthy development was the liberalisation of the Turkish visa policy towards many African countries, which created a pull factor for migrants from this continent. They now arrive in Turkey by plane with easily obtained visas before crossing illegally into the European Union via Greece and Bulgaria." And Turkey's accession to being an EU member state, and the promise by German Chancellor Angela Merkel to "liberalise" visa policy with Turkey, will only make this easier still. "It's a terrible idea. Dropping them from NATO will push Turkey into the hands of our enemies, and we can't afford to do that when they have such a sophisticated military and are in such a literally important geopolitical position." Turkey should be downgraded to a "major non-NATO ally." That's perhaps the most convincing argument against taking steps against Turkey now, and even this is a weak claim. Turkey would need to get along with our enemies to return to their hands, and the Erdogan government has burned its bridges with just about every other rogue state or imposing power. In addition to having shot down a Russian plane this morning, Turkish relations with Iran are at an all-time low due to Iran's support for Assad in Syria. No country has been more vocal in opposing the Alawite leader's rule in Syria than Turkey, aligning it with the United States but making it a controversial actor in the larger Syrian civil war. While many have accused Turkish officials of acting in ways that benefit the Islamic State, ISIS has attacked Turkey twice – the latter a suicide bombing in Ankara considered the worst terror attack in post-Ottoman Turkish history – and given Erdogan little reason to formerly aid the terror group. Alliances with other Western rivals like North Korea, China, Venezuela, or Zimbabwe would prove of little strategic value. Turkey has nowhere to go but West. But it's not either/or, given the position of some major non-North Atlantic players in NATO, as mentioned above. Turkey could be downgraded to a "major, non-NATO ally," and its EU accession timeline reset on the basis of the above. It would have major implications for Mr. Erdogan's government and approach, and one that he couldn't simply respond to by sabre-rattling. His electorate wouldn't stand for it. Turkish authorities as well as the public know they have to be within a Western power bloc to remain as relevant, and to remain as immune to criticism, as they have been for years. But without us making the case against Mr. Erdogan's policies that imperil Western nations, they will continue to have their cake and eat it. And while the food metaphors are relevant it's clear we have to say; at this thanksgiving, we think it's time to forgo the Turkey.